The Russian central bank hiked rates by 25bps on Friday, in line with our expectations. While the median consensus had been for no change, the market was heavily split with neither side having a strong conviction - hence, the final outcome did not affect the ruble. Our own reasoning had been that CBR would not want to fall too far behind the Fed in raising rates. What was slightly surprising from the new projections and statement is that CBR maintained a 5.0%-5.5% inflation forecast for end-2019 and, in fact, see upside risk to this forecast. This is despite the oil price no longer trending up, as had been the case a quarter ago, but having fallen considerably since October. Our own inflation forecast for end- 2019 is a substantially weaker 2.8% - and from this lower level, one can reasonably see upside risk in the event that the US implement unexpectedly harsh sanctions next year. Despite the hawkish rhetoric and CBR saying that it may need to hike again depending on inflation performance relative to forecast, our base-case is that no further rate hike will be needed in this cycle. We see inflation moderating noticeably through H2 2019. Since Russia's real interest rate would rise as a result, the RUB is likely to hold well against the USD. 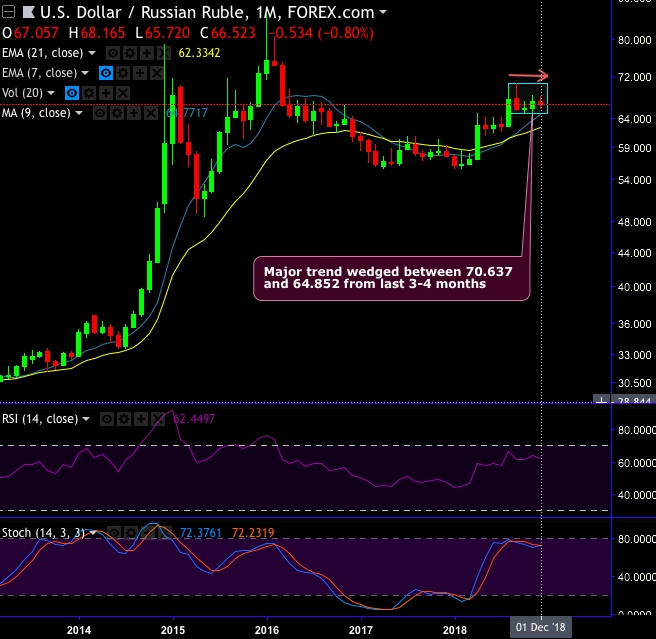 Hence, we see USDRUB sideways at 67.00 by end-2019. Trade tips: At spot reference: 66.521 levels, on hedging grounds, 1m1w USDRUB 1x1 put spread (67.057/64.14) is advocated. Currency Strength Index: FxWirePro's hourly USD spot index is inching towards 6 levels (which is neutral), while articulating (at 13:47 GMT).